Sarah Nicholson (left-center) and Aubrey Roberts (right-center) round a turn. The Wildcats ended their season with a strong showing at the Oxy Invitational. 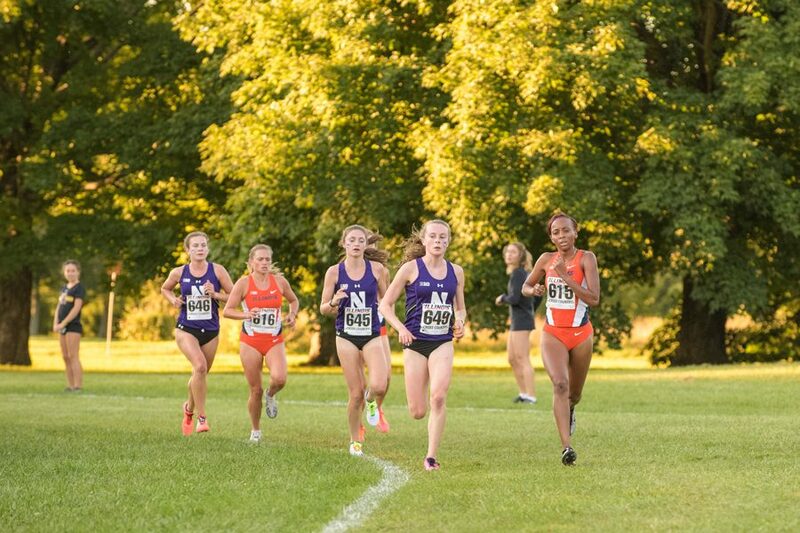 On a beautiful day in Los Angeles, Northwestern finished its regular season with several season-bests and a Wildcat record at the Oxy Invitational hosted by Occidental College. This weekend, sophomore Kelly O’Brien won her heat, placed eighth overall and set a school record in the 1,500-meter event. Four Wildcats set season bests in the same event and senior Haley Albers set a season and personal best in the 5,000-meter. Coach ‘A Havahla Haynes said this meet felt like an appropriate and confidence-building end to the regular season. Unlike O’Brien, sophomore Aubrey Roberts did not win her heat this weekend, but Haynes was not particularly concerned. She said Roberts’ race plan was to simulate what the regional race would be like, so it was successful even though the time wasn’t ideal for a personal best. Regardless, Roberts is expected to receive an invitation to the NCAA Preliminary event in the 5,000- or 10,000-meter later this month. Haynes said they have to wait until Wednesday to find out if O’Brien will get a bid as well. It has been quite the season for the Cats, riddled with top-10 finishes for multiple women on the team. The 2018 leg of the season started with first-place finishes by senior Sara Coffey in the one-mile event and Roberts in the 3,000-meter event. Other Wildcats finished in the second and third place spots in the 3,000-meter. O’Brien said she’s seen a huge change in her self-confidence since the initial races of the season. She said the change was needed in getting into the competitive groove that could potentially propel her to NCAA Preliminaries. In February, senior Andrea Ostenso followed Roberts, winning the 3,000-meter event at the Alex Wilson Invitational. Then, less than two weeks later, Roberts and senior Isabel Seidel — the only two Wildcats competing in the finals at the Boston University Last Chance Meet — both finished in the Top 10 in the 3,000-meter event. After Spring Break, Roberts and O’Brien both took the team’s recent meets by storm. At the Benedictine Invitational in April, Cats took six of the top 10 spots in the 1,500-meter event, with O’Brien and Roberts in first and second, respectively. Roberts took second in the 800-meter event, and O’Brien finished in sixth for the 400-meter. During their first meet of May, O’Brien won the 1,500-meter event at the Huskie Classic hosted by Northern Illinois University. O’Brien said she never thought that she would be racing with top competitors and winning races, like she’s been consistently doing since 2018 began. If she makes it to the preliminaries, she said she hopes to make the most of it.